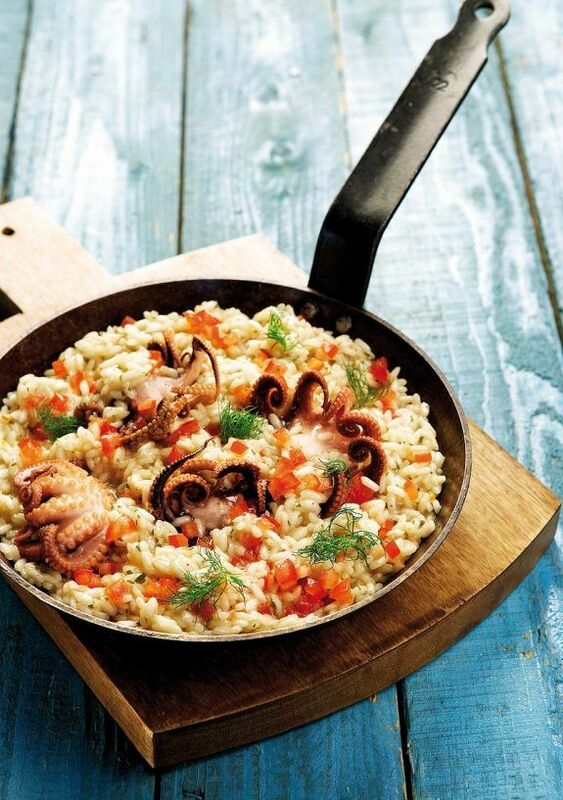 It’s one of this never-fail comfort foods, the coming together of 3 beautiful ingredients – octopus, fresh herbs and ouzo – that make an unforgettable sea risotto. Ouzo gives a nice, star-anise depth of flavor that you will absolutely love. For the octopuses: Carefully cut out both eyes using a knife. Find the mouth/beak of octopuses. Push them out and remove completely. Cut a slit in the heads with a knife. Turn heads inside out. Remove guts without breaking ink sac. Rinse octopuses under running water, place in a heavy pot with vinegar and 1 cup of water. Simmer until tender, for about 45 minutes. Transfer on a plate and when cool enough to handle cut in chunks or use them whole. Reserve any pot juices and mix with vegetable stock. Heat oil in a large frying pan on medium heat and cook onion for 2 minutes. Then stir in garlic for 1 minute until fragrant. Stir in rice for 1 minute. Add ouzo and stir for 2 minutes. Gradually add stock, 1 cup at a time, stirring often for about 20 minutes until rice is cooked and creamy or according to your taste. Remove pan from heat and stir in butter, tomato, herbs and octopus. Cover pan with lid and rest for 3-4 minutes. Serve warm with pepper.